This program is for children born in 2010 (9U) and 2009 (10U). Teams are formed based loosely on school attending. The 9/10 Hive Directors, professional staff and parent coaches will conduct two training sessions a week. The 9/10 Hive Directors will provide parent coaches with assistance with training sessions to help follow the club philosophy and curriculum. Teams play one 7v7 game (six field players and a goalkeeper) each weekend (Saturdays). Games consist of two (2), 25 minute halves. 9U/10U players and teams have the option to play in an in-­house futsal league during the winter season. Game Schedules: All 9/10 games will be played in the football stadium at Ta-Ha-Zouka Park (next to the Western Douglas County Chamber of Commerce Building on Saturday's (20801 Elkhorn Drive). See below for game schedules for each age group for the 2019 Spring season. Gameday Uniforms: The team listed first on the schedule will wear red; the second team listed will wear grey. Hive+ is designed to provide a more challenging training environment for players who have consistently demonstrated exceptional talent and potential. Coaches and club directors will recommend players for Hive+ program. Hive+ players will have the opportunity to participate in the Spring Wolves Cup, May 31-June 2 in LaVista. For questions regarding 9U Hive Program, please contact Andy Staberg at coachstaberg.esc@gmail.com or Anne Schafer, at recdoc@elkhornsoccer.org. 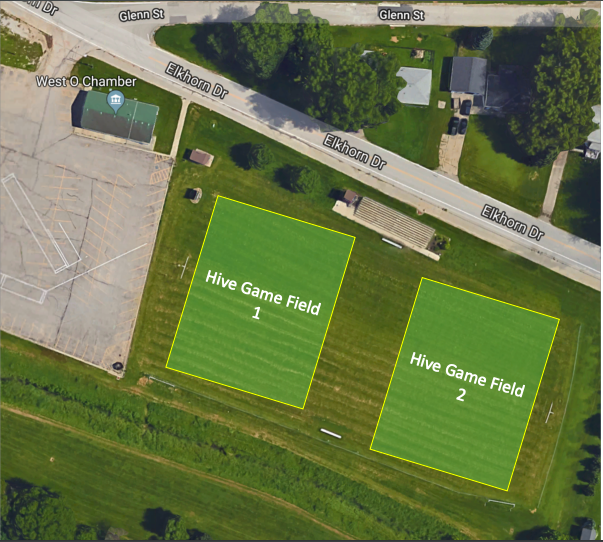 For questions regarding 10U Hive Program, please contact Shane Melrose, at melrose.shane@gmail.com or Anne Schafer, at recdoc@elkhornsoccer.org.